California Girls (1987) #1-8 by Trina Robbins et al. Robbins had done comics for Eclipse before, but it’d been a while. 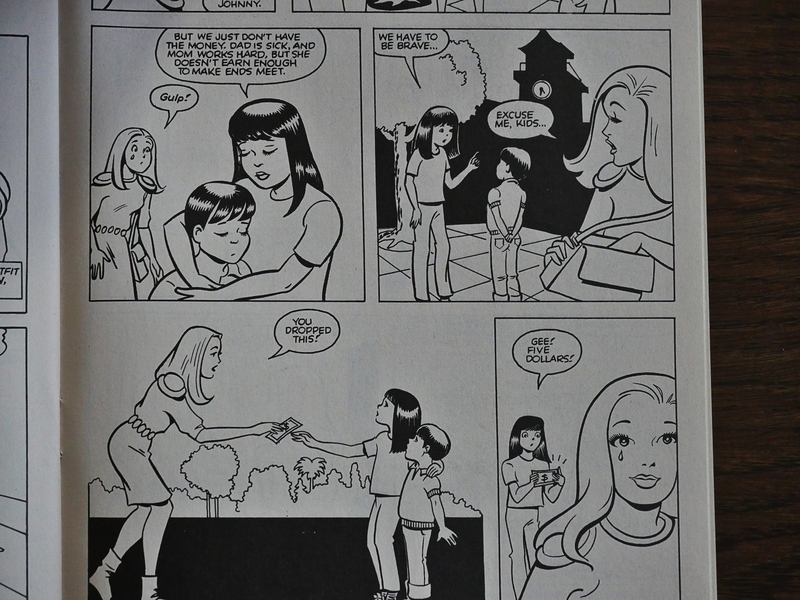 She serialised Sax Rohmer’s Dope in the Eclipse anthologies at the start of the decade, but in the meantime she’d done more child-focused comics, like the Meet Misty mini-series she did at Marvel (and which I very dimly remember I read at the time). Many readers point out the similarities between the series, and if I remember correctly, I think Misty was pretty much like this, too: A group of teenagers having hijinx that deliberately (on Robbins’ side) don’t involve very high stages. The main difference is that the protagonists here are identical twins, so Robbins derives a lot of plotlines and gags from that setup. But perhaps the main draw for the younger readers of this book is that it’s an audience participation book. Robbins invites readers to submit designs for the clothes the characters wear. It’s not exactly a new idea. Bill Woggon was probably the main proponent of this way of getting readers involved with his Katy Keene series. And, of course, later Barb Rausch would also be heavily involved, and Rausch is Robbins’ friend, so it all ties together, and you don’t even need one of those boards in a dimly lit basement where you connect the players with red conspiracy thread. 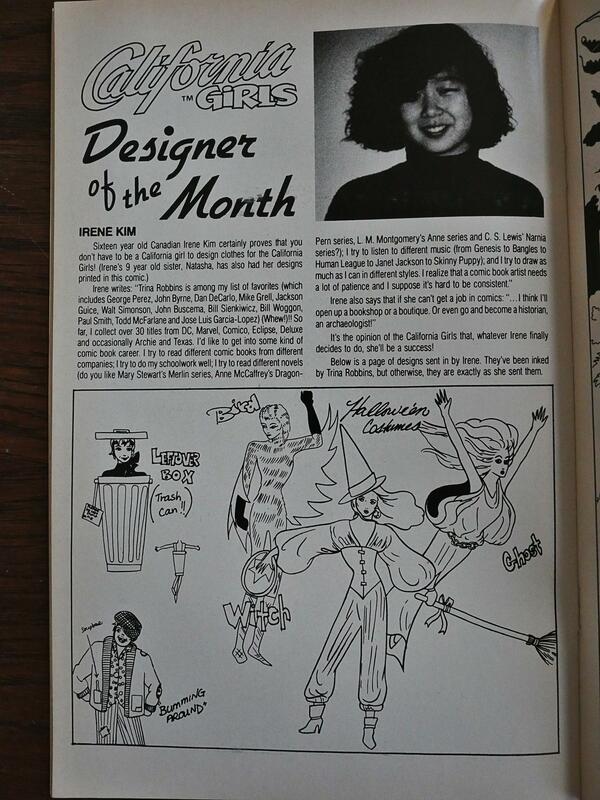 Every issue has a Designer of the Month. 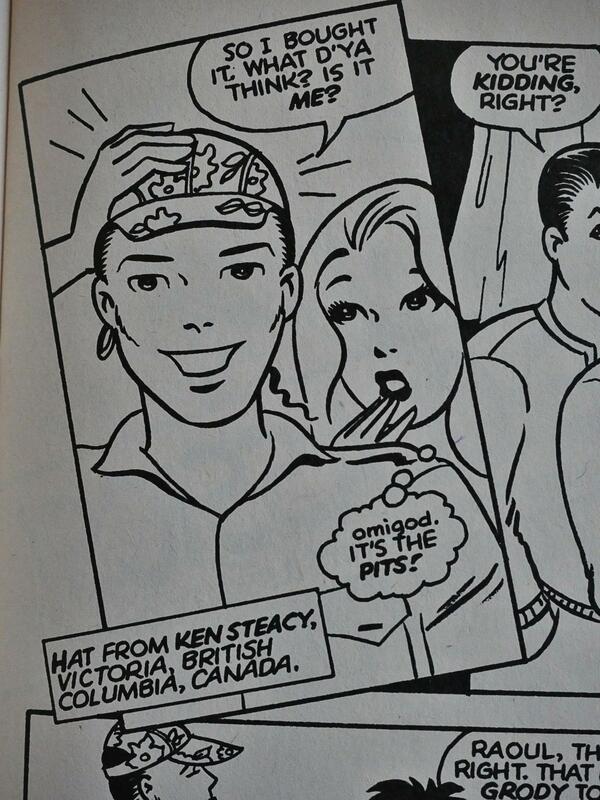 While I guess you could say that the plots are generally not dissimilar from Archie, they do have a more modern outlook. And breaking the fourth wall is always fun. It’s not a very pun-heavy book, but when Robbins wants to, she can get the snappy repartee going. Even if some of these jokes aren’t er 100% original, I think the selection is pretty great, and I can totally see myself finding a page like this irresistibly funny if I were 12. Robbins is a child of the 60s, of course, so you get a few nods towards trying to make the world a better place, but the stories are very lighthearted. Robbins has a certain stiffness about her artwork, but I think this book has her most free-flowing and goofy artwork. I mean, that play fight up there isn’t extremely anatomically correct, but it’s fun and playful. She really gets into exaggerating her characters for fun and action here, way beyond what I can recall her doing before this, and I think it reads wonderfully. This series also represents a pretty large chunk of her published artwork: At eight issues, it’s the longest series she’s done? And perhaps the monthly schedule meant that she felt free to let loose more with her artwork. Dueben: You serialized Dope in Eclipse Magazine and Eclipse Monthly over a couple years. You did a few projects with Eclipse over the years. Robbins: They were great. They were really inclusive and they were willing to take chances. I have nothing but the fondest feelings towards Cat [Yronwode] and Dean [Mullaney]. I worked with Dean later. He was my editor when I did the collected Miss Fury and he did a gorgeous job on that book. 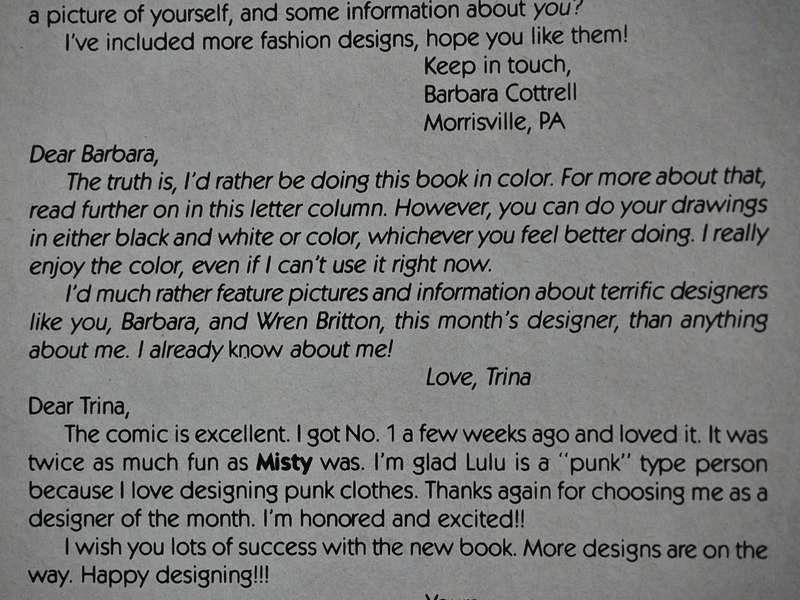 In a desperate attempt to revive comics for girls in the eighties I had gotten Jim Shooter to let me agree to do a six part miniseries for Marvel, Misty. It failed miserably simply because it just didn’t get any distribution at all. In those days if you wanted to buy a comic, you had to go into a comic book store which was wall to wall boys and they didn’t want to carry anything for girls. Though I used to get manilla envelopes stuffed with letters from girls who loved Misty. They said I love your comic but I have such a hard time finding it. When that ended I went to Eclipse with a proposal to do a comic for girls and they took the chance. 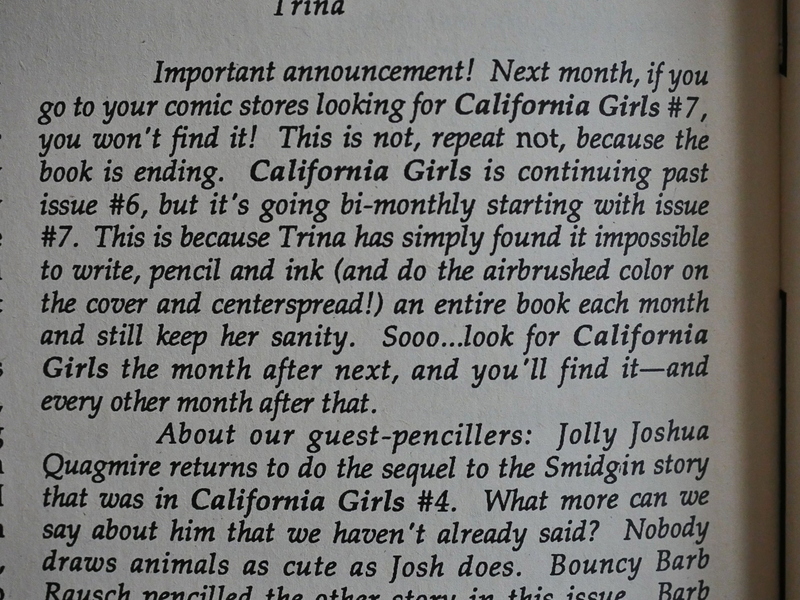 We did eight issues of California Girls and it finally failed for the same reason–the comic book stores simply wouldn’t carry it. Dean and Cat were always taking chances. They were really good about that. Robbins states that she’d prefer to publish the book in colour, but that Eclipse just can’t afford to at the current sales level. And, yes, I think Robbins’ artwork would look even more attractive in colour. There’s so much wide open white space on these pages that screams out for somebody to slap some colour onto them. With the fourth issue, the monthly pace of publishing was probably starting to take a toll. From that issue on, about half of each issue (i.e., one or two stories, because each issue is three or four stories) is pencilled by somebody else. But Robbins still does the writing and the inking. Above we have Joshua Quagmire who doesn’t really try to follow the model sheet at all. Carol Lay sticks closer to Robbins’ designs, but it still looks way different. But nice. 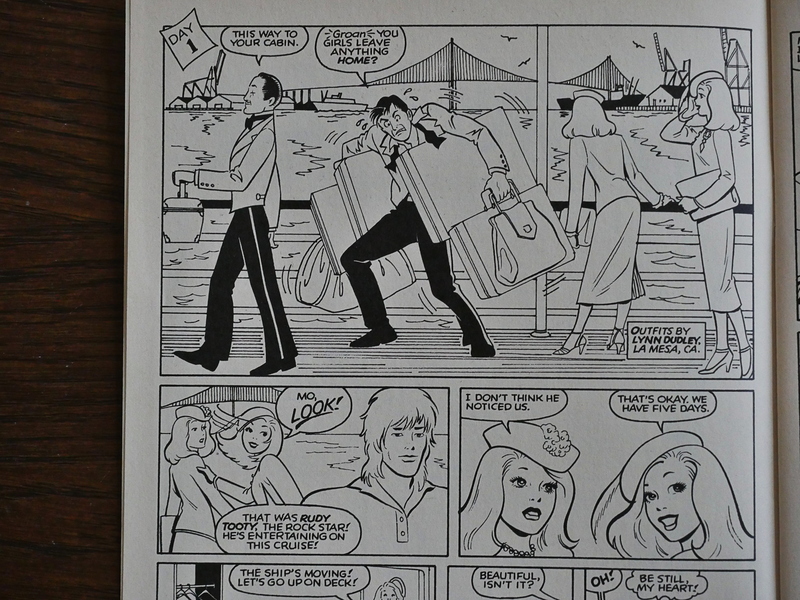 But best of all are the stories pencilled by Barb Rausch. They look more glamorous than Robbins’ pencils, but they characters remain very recognisable. And she’s even better with physical comedy. Of course, when readers send in their designs, it wouldn’t be nice to make fun of the designs in the stories. It only happens here, with a design from Ken Steacy. Since he’s a comic book artist, too, I’m assuming this is an in joke of some kind. We get an announcement that California Girls switches to a bi-monthly schedule because it was just too much work for Robbins. The girls go to Hawaii and we get a sweet story about dolphins and the dangers tuna fishing represent. It ends with a recommendation to only buy white tuna, since dolphins don’t hang around those. 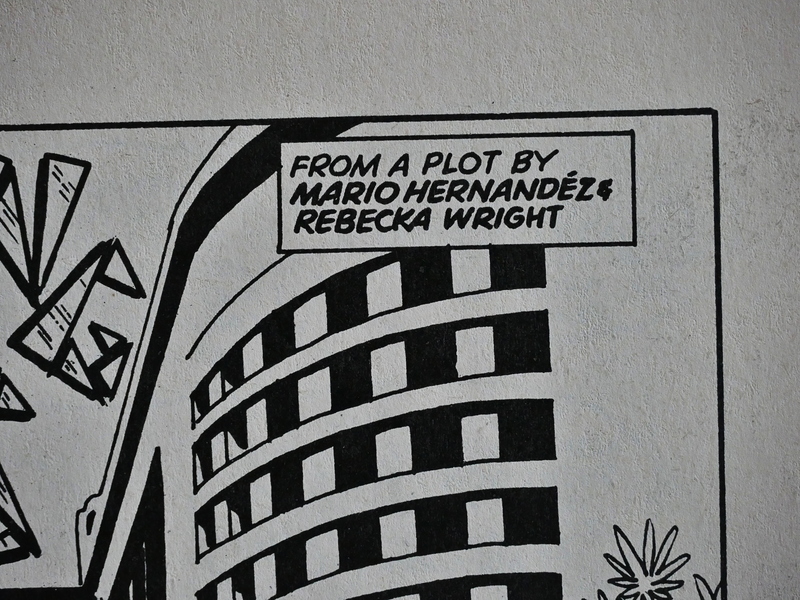 Instead of a bi-monthly schedule happening, there’s a four month pause before the final issue, which contains fashion contributions from Mario Hernandez, with an accompanying co-plotting credit. And we also get tips on how to jazz up our old sweats. 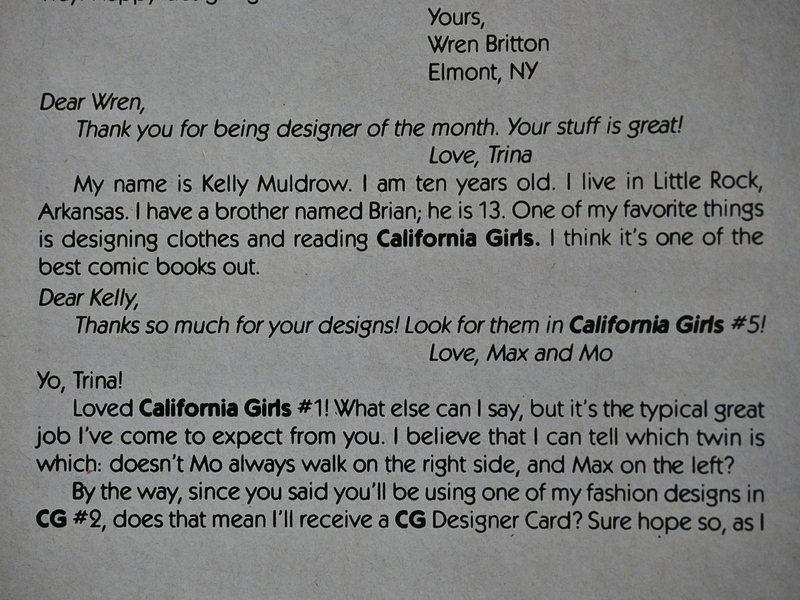 And, as usual in the final issue of a series, we’re told that California Girls totally isn’t cancelled or anything. 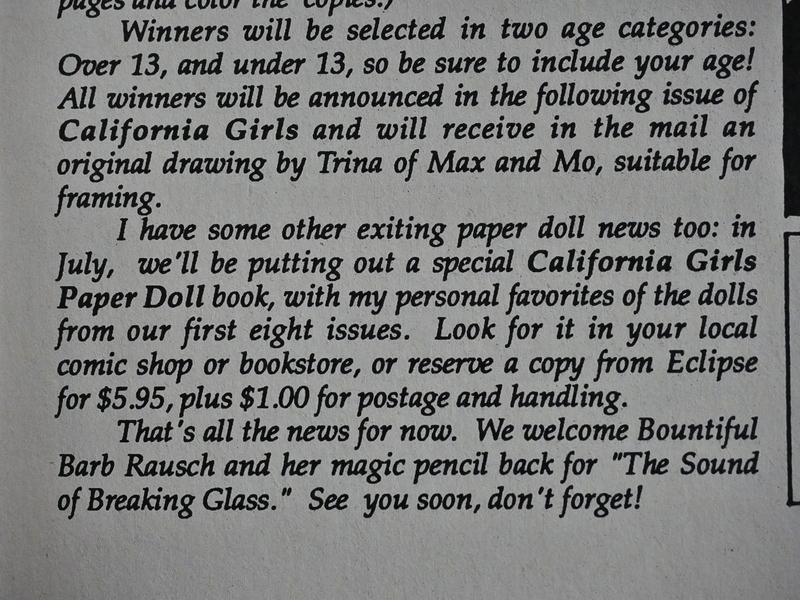 A new competition is even announced, as well as a California Girls Paper Doll book. 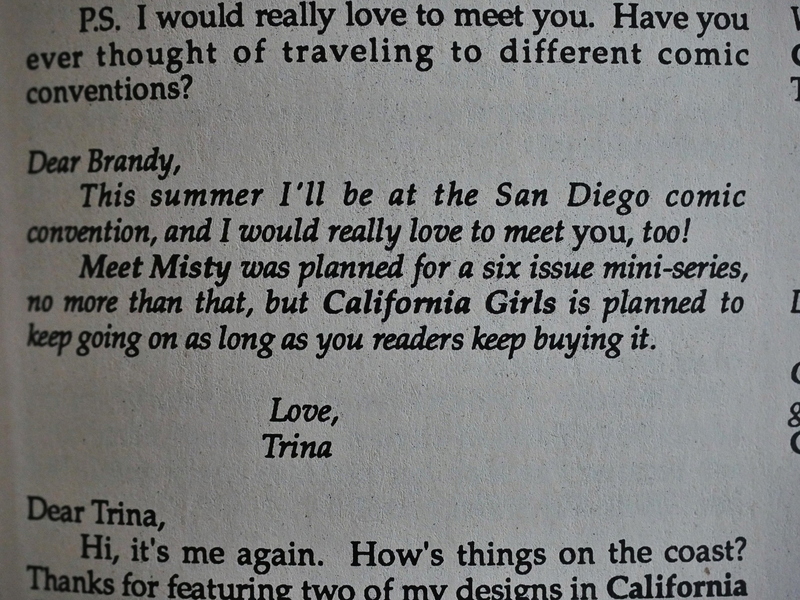 The latter wasn’t published until a year later, and I’ve been unable to find out why California Girls was cancelled, but I’m assuming low sales. There was so much room to go into the chronological details of Robbins’ publishing career, but instead just five pages are devoted to Wimmen’s Comix. Fewer still to It Ain’t Me Babe and other fairly legendary titles. That’s less space than is given to Jim Morrison, and fewer than to making clothes for celebs on the Sunset Strip. The gist of the criticism is that 1) comics are interesting and 2) clothes aren’t, so if a comics artists writes an autobiography, it should be all about the comics and not about the clothes. And while I, too, would have wanted to read more about the comics she made (because I think they’re good), that’s not the book she chose to write. The book she did write is pretty good, though. 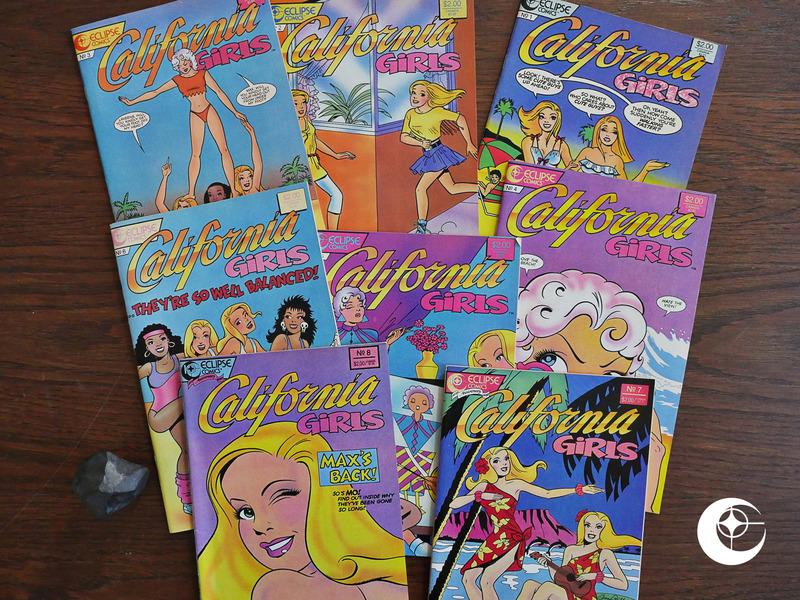 As for California Girls, it has never been collected or reprinted, which I think is a real shame. A colour version of this would make a really handsome book. They could include fold-out paper doll sheets. It’d be cute.